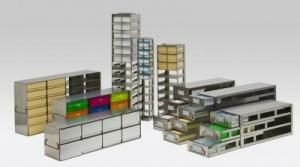 NextDayScience Freezer Storage Racks are constructed of high-quality, corrosion resistant stainless steel. Handles at both ends accommodate freezers with right or left handed doors. Our freezer racks have been configured to fit all major ultra low (-80°) freezers on the market. These freezer racks fit all brands of 2" cryovial boxes.